Dog Illnesses: It is so upsetting when our dogs become sick. They can't tell us what's wrong but all dog owners understand when their dog is sick. Many of us like to have an idea of what is causing the problem and what dog illnesses might be to blame. Symptoms to watch out for that might indicate dog illnesses include variations in appetite, sluggishness, weight loss or weight gain, excessive thirst, lameness, hair loss, wounds, sore patches, irregular breathing, vomiting, diarrhea or frequent urination. It up to you to decide whether a vet of canine health specialist should be consulted - always make sure that the telephone number of the vet is in a prominent position. 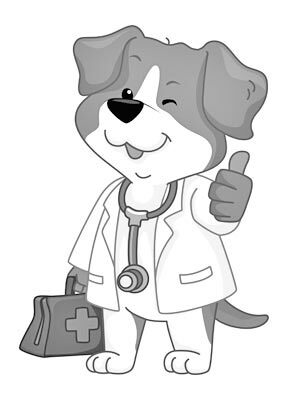 If dog illnesses cause you concern the best advice is to contact your vet as soon as possible. This article provides an indication of some possible causes of dog illnesses and additional information is available via Dog Health. Dog Illnesses - Abdominal Pain: The causes of Abdominal Pain include Canine Hepatitis, Dog Constipation and Canine Enteritis. Dog Illnesses - Abdominal Swelling: The causes of Abdominal Swelling can include Canine Bloat and Roundworm in puppies. Dog Illnesses - Behavioral Changes: The causes of Behavioral Changes can include Arthritis, Heart Disease, Rabies, Red Mange, Canine Parvovirus, Tapeworms, Whipworms and Hookworms. Dog Illnesses - Blood in Urine: The causes of Blood in Urine can include Kidney Disease. Dog Illnesses - Bloodshot Eye(s): The causes of Bloodshot Eye(s) can include Eye Infections and Entropion. Dog Illnesses - Difficulties with Breathing: The causes of Difficulties with Breathing are numerous and can include Heart Disease, Heartworms, Parvovirus, Allergies, Ruptured Diaphragm, Obstructed Airway, Lungworm, Bronchitis, Pneumonia, Heatstroke and Poisoning. Dog Illnesses - Constipation: The causes of Constipation can include Intestinal Obstruction and a Hernia. Dog Illnesses - Coughing: The causes of Coughing can include Distemper, Heart Disease, Heartworms, Canine Hepatitis, Kennel Cough, Roundworms, Parvovirus, Allergies, Lungworm and Pneumonia. Dog Illnesses - Ear Scratching: The causes of Ear Scratching can include Ear Infections (Otitis Externa), Fleas and Allergies. Dog Illnesses - Eye Discharge: The causes of Eye Discharge can include Eye Infections, Conjunctivitis, Distemper, Entropion, Kennel Cough and Allergies. Dog Illnesses - Fainting: The causes of Fainting can include Heart Disease and Heartworms. Dog Illnesses - Falling: The causes of Falling can include Canine Epilepsy and Wobbler Syndrome. Dog Illnesses - Fever: The causes of Fever can include Kennel Cough, Red Mange (Demodectic), Parvovirus, Distemper, Hepatitis, Lyme Disease, Kidney Disease, Heatstroke, Poisoning, Diabetes and Heart Disease. Dog Illnesses - Hair loss: The causes of Hair loss can include Mange, Sarcoptic Mange, Walking Dandruff - Cheyletiella Mange, Allergies, Cushings Syndrome, Over-Active Thyroid, Fleas, Ringworm and Allergies. Dog Illnesses - Head Shaking: The causes of Head Shaking can include Ear Infections - Otitis Externa and Fleas. Dog Illnesses - Itching: The causes of Itching can include Fleas, Mange, Tapeworms, Ticks, Walking Dandruff - Cheyletiella Mange and Allergies. Dog Illnesses - Lack of Appetite: The causes of Lack of Appetite can include Heart Disease, Heartworms, Kennel Cough, Lyme Disease, Red Mange - Demodectic. Dog Illnesses - Lameness: The causes of Lameness can include Arthritis, Hip Dysplasia, Lyme Disease, Patellar Luxation, Wobbler Syndrome, Interdigital Cysts and Aortic Thrombosis. Dog Illnesses - Lethargy: The causes of Lethargy can include Arthritis, Heart Disease, Hookworms, Kennel Cough, Kidney Disease, Lyme Disease, Parvovirus, Roundworms, Scabies - Sarcoptic Mange, Tapeworms, Whipworms. Dog Illnesses - Nasal Discharge: The causes of Nasal Discharge can include Distemper, Kennel Cough and Allergies. Dog Illnesses - Pain on movement: The causes of Pain on movement can include Arthritis and Hip Dysplasia. Dog Illnesses - Over Salivation: The causes of Over Salivation can include Canine Bloat, Rabies, Heatstroke, Poisoning and Epilepsy. Dog Illnesses - Scratching: The causes of Scratching can include Fleas, Mange, Tapeworms, Ticks, Walking Dandruff - Cheyletiella Mange and Allergies. Dog Illnesses - Seizure: The causes of Seizure can include Distemper, Epilepsy, Hepatitis, Kidney Disease and Rabies. Dog Illnesses - Squinting: The causes of Squinting can include Entropion and Eye Infections. Dog Illnesses - Stumbling: The causes of Stumbling can include Kidney Disease and Wobbler Syndrome. Dog Illnesses - Urination problems: The causes of Urination problems can include Kidney Disease. Dog Illnesses - Vomiting: The causes of Vomiting can include Bloat, Distemper, Enteritis, Hepatitis, Kidney Disease, Parvovirus, Tapeworms, Roundworms, Allergies, Food / Toxic Poisoning, Diabetes, Addisons Disease, IBS, Over-eating and Food Allergies. Dog Illnesses - Weight Loss: The causes of Weight Loss can include Heart Disease, Heartworms, Hookworms, Roundworms and Whipworms. Dog Illnesses: Asyou can see by the above list many dog illnesses can be serious. If you are in any doubt about your Dog's or symptoms of dog illnesses please consult your Vet immediately.